Featured amenities include multilingual staff and laundry facilities. For a surcharge, guests may use a roundtrip airport shuttle (available 24 hours) and a train station pick-up service. 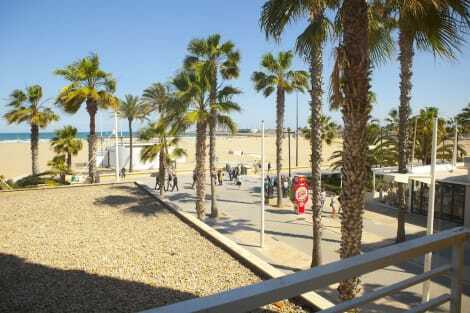 The family-friendly city hotel is situated around 3 km from the centre of Valencia, in front of Las Arenas/Malvarrosa beach, which stretches as far as the eye can see. The beach hotel is only metres from the America's Cup Port and the Valencia F1 race circuit, and guests will find bars, nightlife, and links to the public transport network in the immediate vicinity. There is a shopping centre just 2 km from the guesthouse and the bus and train stations are 5 km and 3 km away, respectively. The design hotel is approximately 18 km from Valencia airport and around 181 km from Alicante El Altet airport. In addition to comfortable chic design, the air-conditioned beach hotel offers great hospitality, good dining options and a very personal approach, which are only a few of the ingredients which make it such a special place where guests can get to know and enjoy the spirit of the city. The guesthouse offers 22 rooms in total (all exterior, some with balcony) and welcomes guests in a lobby with 24-hour reception and check-out services, a hotel safe and lift access. A cafe, bar and restaurant provide food and beverages. Guests may also make use of the WLAN Internet access, room and laundry services, and a garage (fees apply). All the rooms are equipped with an en suite bathroom with a shower, bathtub and hairdryer, while a double or king-size bed, and a private balcony or terrace also feature as standard. Other in-room amenities include central heating, individually controlled air conditioning, a direct dial telephone, a complimentary safety deposit box, a minibar, Internet access and satellite TV. Sun loungers and parasols are provided free of charge at the hotel, and for an additional fee on the nearby sandy beach, which is 50 m from the hotel. A range of water sports are available just 100 m from the hotel. A breakfast buffet is served each morning and set menu and à la carte options are available for lunch and dinner. Guests may dine on the terrace with sea views. This hotel is situated next to the promenade and city beach in Valencia. Many bars and restaurants line the avenue and those who enjoy cycling can find excellent routes in the area or why not even explore the entire downtown, for their convenience the venue offers bicycle rental services. Those who prefer little extra comfort can move around through the convenient tram stop, which is just a 2-minute walk away, and which offers easy access to the subway. After a day of lazing around on the beach or sightseeing, guests can enjoy a delicious meal at the onsite restaurant, followed by a chilled cocktail or a glass of excellent Spanish white wine, before heading to their comfortable room for some much deserved rest. With a stay at Casual del Cine Valencia , you'll be centrally located in Valencia, just a 3-minute walk from Plaza del Ayuntamiento and 9 minutes by foot from Central Market. This boutique hotel is 0.5 mi (0.8 km) from Plaza de la Reina and 0.4 mi (0.7 km) from University of Valencia.